The new British Airways Club Suite is here! This is part two of my article on the brand new British Airways Club Suite seat, launched today. Part 1 of my BA Club Suite review is here if you click through. As I said, the seat is called Club Suite. And the reason it’s called Club Suite is that ….. The British Airways Club Suite has a door! Yes, you get a door. Is this is a gimmick? Possibly. Super Diamond / Elements seats are already very private, as are the similar Cirrus seats such as those used by Air France on its refurbished Boeing 777 aircraft. The door isn’t very high. Cabin crew, and of course anyone walking through the cabin, can see you as clearly as they can see you in the current seat. It’s not like the new Emirates First Class suite which I reviewed here where you are fully enclosed and – if you wish – the crew pass you food through a hatch! On the other hand, the door is high enough to make the seat surround feel higher than usual. 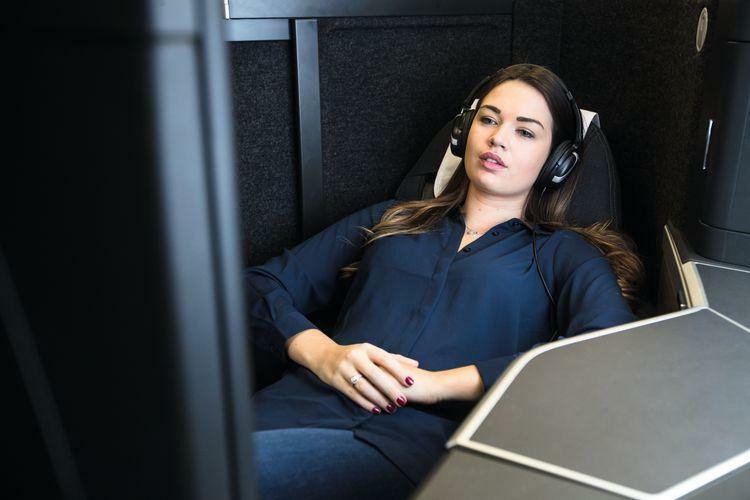 Whilst you shouldn’t draw too much from a VR simulation, you may find it more claustrophobic than similar seats. This is really something that needs to be tested in the flesh though. Gimmick? You decide. But as a marketing tool, it is fantastic. How does Club Suite differ from Qatar’s Qsuite? Let’s be clear about what you’re getting here. This seat is Super Diamond / Elements with a door. It isn’t Qsuite, where the seats are not angled at 30 degrees and where you can pre-book a pair or even a block of four seats for your group and remove the internal dividers. For the solo traveller it doesn’t make any difference. For a pair or family of four there is a difference because you can’t create your own private space with Club Suite. The new arrangement is worse than Club World for families with young children because you can’t be within (literal) arms reach of them. Couples may be annoyed that they need to sit away from the windows, in the middle block, if they want to be able to chat during the flight. What about families with babies? Bassinet seats will still exist. Whilst it wasn’t part of the VR simulation, the second of the two A350 Club Suite cabins has space for bassinets to be attached in front of the first row of suites. What is the Club Suite colour scheme like? Dark and classy. Remember that I have only seen this via virtual reality so it is hard to get a clear impression. There are lots of browns, blacks and greys, which of course sit alongside the grey White Company blankets and black amenity kits. Is it too dull? The Air France Cirrus seat has bright red storage cupboard doors, for example, which certainly livens things up. Let’s see how it works in practice. In reality, it doesn’t really matter how the cabin looks when it is empty because the passengers literally bring their own colour. The walls of the suite are covered with a furry material that BA likened to the stuff that lines your car boot! This is designed to help muffle any sound, which is increasingly becoming an issue as newer aircraft become quieter and quieter and passenger noise becomes more noticeable. It isn’t clear how the 56 seats on the A350 will be split. The VR simulator showed a 48 seat open cabin which looked very dorm-style, with presumably a smaller 8-seat cabin behind. Cathay Pacific uses a similar layout on its A350 fleet so this may well be accurate. 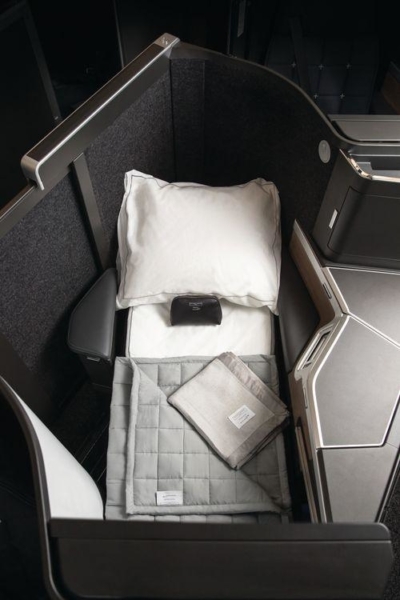 There is a risk that BA is recreating the ‘dorm’ feel of the Boeing 777. The Club World experience in the two-row forward cabin on a Boeing 787-9 is a million miles ahead of the Club World experience on the Boeing 777. Lighting also makes a big difference as anyone who has flown the 787 will know. Food and drink is also a large part of the business class experience. The decision to move the catering contract to Do&Co from 2020 should lead to a noticeable improvement in quality, similar to what is currently offered on New York JFK and the handful of other routes it already caters. Final words …. what do I think of BA’s Club Suite? Club Suite is good, very good. If I am honest – and I said this to British Airways on Friday – it is at the top end of my expectations. There was a risk that BA would go for ‘good enough‘ . By ‘good enough‘, I mean ‘something that’s not as good as the leaders but which is good enough to make you pick a direct BA flight rather than an indirect Etihad / Qatar etc flight‘. I underestimated them. I’m not totally sold on the colour scheme but this looks as good as anything else I have flown lately, even if the door is arguably a gimmick more than anything else. That said, I never close the doors on First Class suites when I have them. Perhaps the suite sides are too high, perhaps not. What I would say, having spent time with the lead designer of the seat on Friday, is that BA has gone to a lot of trouble on the small details. Lighting looks good, for example, and the new layout means that overhead lighting is available again too. Little details like the vanity mirror will be appreciated. When can I try Club Suite? Don’t get carried away. Alex Cruz admitted in a recent presentation that he expects satisfaction ratings for the current Club World seat to fall sharply when passengers walk onto their plane and realise that they are not getting the new product. Manufacturing is apparently restricted to three seats per day. British Airways has talked about a four year plan to roll the seat out. It seems that it won’t be going onto the Boeing 747 fleet which is being retired over the next four years. No-one was willing to confirm that it would go onto the A380 fleet either. By Christmas, the plan is for six aircraft with Club Suite to be in service. Four will be new A350 planes and two will be refurbished Boeing 777 aircraft. I would imagine that you will then see roughly one plane per month converted after that. 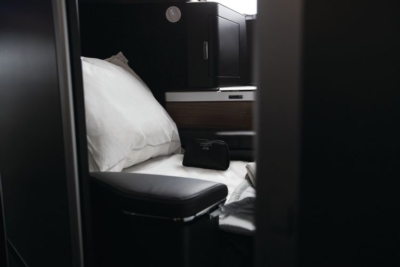 As there is no First Class on the first batch of A350 aircraft – and possibly not on the 2nd batch either – Club Suite will be not be used on prime routes like New York JFK straight away. Toronto and Dubai are probably typical of the destinations where you will find it. ‘Prime’ routes will need to wait until four-class Boeing 777 aircraft are retrofitted. That said, as I was sitting in my little virtual reality cabin on Friday, I did begin to wonder where First Class sits in the world of Club Suite. With a business class seat like this, First Class needs to be more about the fine food, fine drink and specially trained staff who work exclusively with First Class passengers. The Grand Siecle champagne aside, British Airways doesn’t have this. If you want to be one of the first people to give Club Suite a try, you may see it on the first Madrid flight of the day (06.20!) from mid August. It isn’t timetabled yet because the exact delivery date from Airbus is only confirmed 30 days in advance. From September / October it will move to selected Toronto and then Dubai services. Over to you, Virgin Atlantic. I look forward to seeing your effort next month. After all… Alex knows what he is doing. He is smart. IAG had great results primarily driven by BA. It’s only about the experience when they’re struggling filling seats after all. Looks good as long as they clean it well. Those ‘furry’ walls are going to be hard to clean once someone wipes their greasy hands on them or food gets spilt! All the extra storage places will soon be a haven for crumbs as well. So BA need to invest in cleaning and give the cleaners the tools to do the job properly. But this seat does look good. BA just need to roll it out as fast as they can. I got compo avios for a disgusting CW footrest and filthy side lockers on a 747 flight back from Denver . Corporate response from BA x2, emailed Alex Cruz with pics. Phone call next day from his office staff. Given how dirty my seats in First usually are, I wouldn‘t bet on clean CW seats. I wonder if ill be able to pick a seat up next year on a redemption booking…. Whoops not sure how I managed to duplicate that post! BA are still guaranteeing 2 Club rewards on every flight so as a minimum there will be two with more depending on how busy the cabin is or isn’t. This new seat is almost as good as the current first class seat!! Hopefully the prices will stay the same as the current club world. I don’t see a problem with 48 or even 56 seats in a single cabin. AA’s 77W has 44 seats in the main J cabin, but each seat has a wonderful feeling of privacy. CW feels like a dorm of you are in an aisle seat with someone sleeping next to you just across the aisle, with no barriers and no privacy. I can’t see that being a problem with reverse herringbone seating, no matter how big the cabin is. Well done BA. Maybe they have aspirations to become World Class again. Let’s hope so. The large PE cabin also sounds interesting. Quality and space if you are prepared to pay a little more. Cattle class for people who only care about price. Wow! I really wasn’t expecting them to push the boat out but credit where it’s due, this is a great effort. Sadly by 2022, who knows what new creations ME airlines will have but it’s still a big step up for folks based in the UK. Etihad will have lost several more billion dollars by then and probably not in existence! Ha – When you have an endless supply of money, what’s a couple of billion every year. Looks great. What does this mean for seating density – and the knock on effect to redemption availability ? Not a lot of difference. 777 is offset by smaller F cabin too. The current 4 class 777 has 56CW seats. Making 1st class smaller to keep the same CW is something that makes sense (but costs BA potential revenue). Golly a decision for passengers! I hope they have fully tested the materials for wear and tear – the new First on 787s are already looking shabby whereas the old QR seats on A380s still look brand new. Agree, the white stitching, although attractive now, could start to look grey with use. Still much better than on what’s on offer now and looking forward to seeing what they come up with for F.
A real double edge sword for me….with a 2 year old kid, the layout does Mr work. I only hope is that by the time BA install it in the majority of the fleet, my kid will be 5/6 by then. I think Alex C was quoted as saying the new seat would be ‘Qsuite with a BA twist’ – Turns out this was quite a literal description! 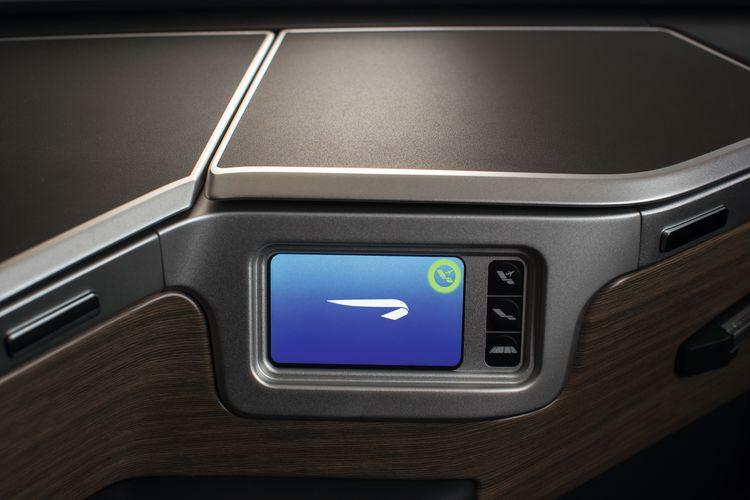 Anyone else notice how the armrest doesn’t seem to lower so it is level with the bed? It would be a shame to restrict shoulder space, as the seat already seems like it isn’t the widest. Or maybe I am looking at the photos wrong! But I can imagine 99% of people being thrilled with this, it seems to deliver what they promised. TPG suggested the arm-rest does level with the bed, although I’m not sure where that’s come from, it doesn’t appear to be in the BA press release. Arm rest moves up and down, same as the AA, Air France etc ones (albeit that is a Cirrus seat). Excuse my ignorance but isn’t this something which the majority of flag carriers did 5 years ago… and better? Yes, it’s a decent offering but about time right? Yes, if you’re talking the 121 layout, but not many flag carriers have suites with doors, etc..
And certainly with QF & SQ I do find myself in a 222 arrangement now and again which, other than the density, is actually worse than current Club World in my view. SQ 777-200s are 222 and angle flat too, and they fly that SIN-MEL-WLG. Why will it Debut on the Madrid Flight? As a long-haul seat does this plane then fly to the US/Asia? This is so the cabin crew and staff get used to the new seats and cabin, before flying the plane long haul. This is part of crew training to familiarise crews with the plane. This is a pretty standard practice in the airline industry, to work out any kinks before starting longhaul flights with the plane. It also means BA will be able to complete four ‘decent length’ short haul sectors a day if they wanted, allowing them to familiarise more crew in a shorter timeframe.